Sell Us Your Gold address, phone, website, hours of operation, and more. 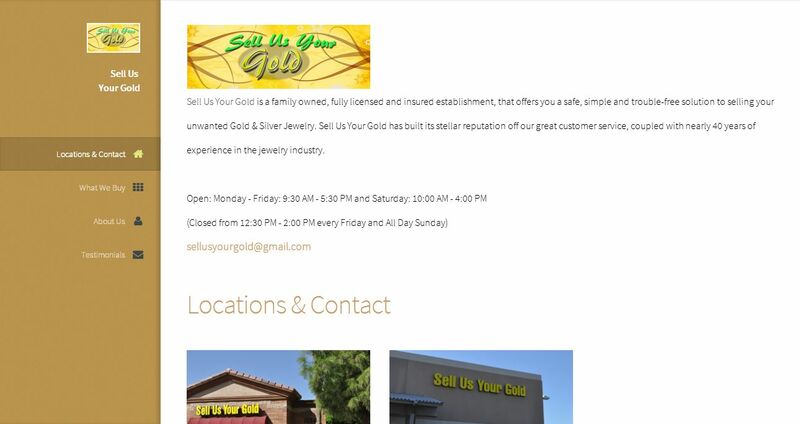 Sell Us Your Gold has built its stellar reputation off our great customer service, coupled with nearly 40 years of experience in the jewelry industry. We provide the best possible pricing on the market, and adjust our pricing according to the market. Come and experience for yourself – you will not be disappointed! Every location of Sell Us Your Gold is handled by jewelry industry veterans, who have a great deal of expertise and integrity – and will maximize your value as the customer.